Are you looking for a pixel art maker to help you create fantastic pixel art and sprite animations for your game? If so, you’re in luck! We’ve scoured the world wide web and rounded up some of the best pixel art maker tools that you can use to create your own pixel art online with minimum effort. These cool pixel editor programs range from free and very user-friendly to more advanced professional software. They can be used as alternative options for making game art or as a companion with other graphic design software like Photoshop. Using these powerful editors with pixel creator settings can make the entire process of making pixel art for your game faster and easier. So, let the pixelated countdown begin! Cosmigo’s Pro Motion NG is one of the most popular pixel art tools for mobile game developers and designers alike. Professional studios such as Glu Mobile, Halfbrick, Gameloft, and more have used this pixel art maker to help them design many of their hit games including the indie classic Shovel Knight. It has a wide array of features that allow you to draw pixel images, edit, and animate sprites like a Pro. You can also create pixel perfect tiles and level maps all within the software. Plus, there are tons of layer effects, painting modes, textures, brush tools, animations, and shading options. Pro Motion NG is available on the Windows platform. However, there are a few workarounds for Mac users that you can try like Wine and PlayOnMac to download it. They offer both a limited free edition and a full paid version for $39. Another excellent pixel art maker to use is Aseprite. This pixel editor has all the core features you need to make professional looking pixel art for your game. Plus, it has a user-friendly interface that’s great for anyone new to pixel art design. You can create animated gifs, image sequences, and sprite sheets in png. or json. Files. There are also different color and paint options including palette control, custom brushes, and easy to use blend modes. You can even create pixel animations using onion skinning to view other frames for comparison while you’re designing. Aseprite is available for Windows and MacOS for $15. Created by Daniel Kvarfordt, Pyxel Edit is a pixel art maker that’s perfect for indie developers. This pixel drawing and animation tool covers all the basics and is available for free with the advanced Beta version priced at a mere $9. You can make cool pixelated animations and images and export them as sprite sheets or even GIFs. Similar to Cosmigo’s Pro Motion NG you can flip, rotate, edit, and sync tilesets too. All of the essential pixel creation features are included with this stripped down editor so that you can focus on design. It’s built in Adobe Air and available for both Windows and Mac users. 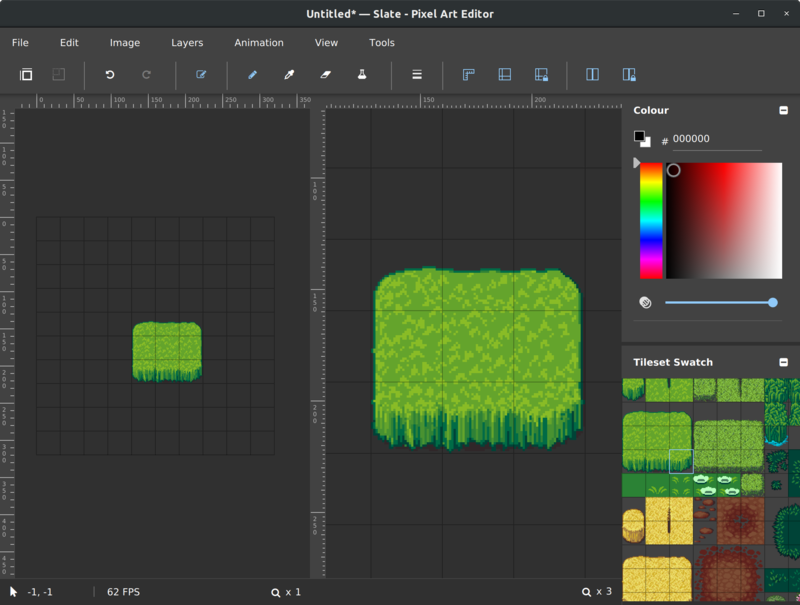 Piskel is a great free option for creating 2D pixel art online. It’s opensource and browser-based with an optional downloadable offline version for both Windows and Mac users. You can jump right in creating animations and pixel art for your game’s design. Conveniently make gifs, png sprite sheets, or zip files with each frame saved separately. There are also settings that enable you to import images and draw over them, view a live preview, quickly resize, and export directly to your computer. The Piskel App also has an option to share your creations with other pixel art lovers in an online Showcase Gallery. PikoPixel is another free opensource pixel editor for making pixel art and sprites. It’s primarily for Mac users with compatibility with Linux and BSD. This editing tool is easy to use with a forgiving unlimited undo feature. You can make pixel art by tracing images. Use a wide range of color palette and blending options and even customize your background canvas. For a free tool, it provides a solid amount of functionality for pixel artists. GraphicsGale is a free pixel art maker for Window users that is similar to Paint.net. You can draw pixel art and animations using popular editing tools like color blending, layer control, the use of various brushes and pens, and the coveted onion-skinning option. If you’re an artist and have some cool sketches that you’d like to transform into pixel art, it’s easy to do with GraphicsGale. The TWAIN feature allows you to snap a photo of your masterpiece and import it into the software from any digital camera or scanner. You can also preview any animations during the editing process to help you get your design just right. The free open source alternative to Photoshop known as GIMP can also be used as a pixel art maker. There are tons of tutorial online that show you how to use it to make your own pixel style game art step-by-step. Much like Photoshop, there is a learning curve for beginners, but if you’re intermediate or an advanced graphic design software users that are familiar with all the shortcut commands and tools, it’s a great free option to use. 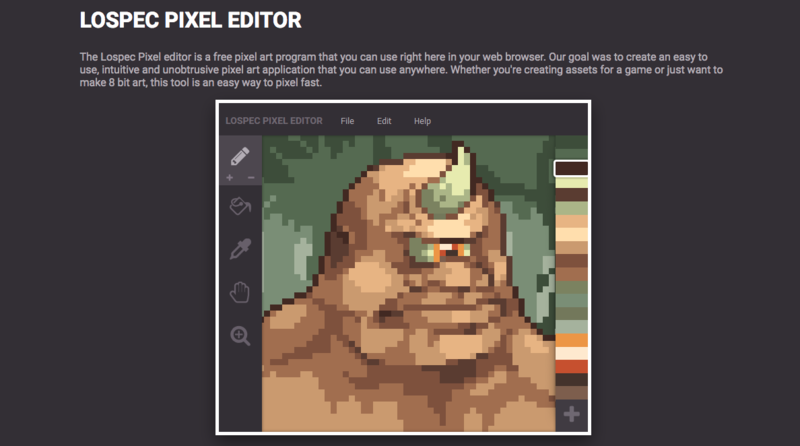 The Lospec Pixel Editor is a free browser-based tool that allows anyone to make pixel art. It’s beginner friendly and features a simple interface and presets to help get you started. You can choose your custom image size and color palette from their drop-down list or specific preset. Preset options include Gameboy Color, Pico-8, or Commodore 64. It’s not loaded with features, but it has the core tools you need to make some cool 8-bit game art on the fly. Krita is a graphic design tool that you can also use as a pixel art maker. This free open source program has many of the same high-quality painting and editing tools as the others on this list. Created solely for artists in need of an inexpensive tool to design with, Krita allows you to make all types of art from portraits and comics to pixel art. You can find plenty of tutorials on how to use it to make pixel art on YouTube and via their ‘Learn’ section. The learning curve is similar to GIMP, but it’s definitely worth checking out. 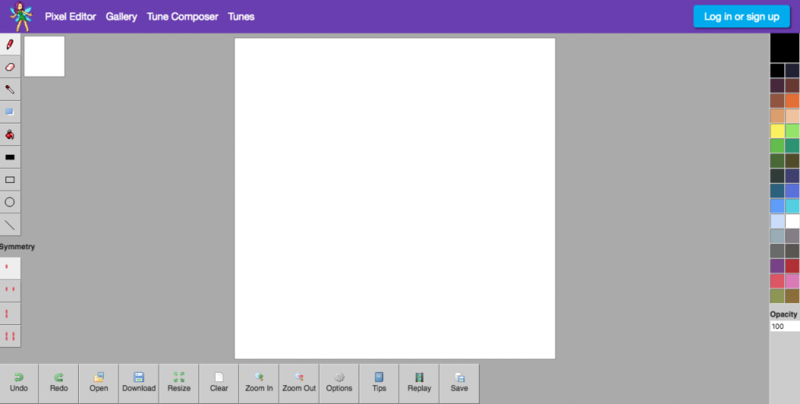 Slate is a free pixel editor that’s beginner and user-friendly. You can download it for Windows, Mac, and Linux via GitHub. With Slate, you can create and edit pixel images, add layers, make eye-popping 2D tilesets for your game and more. There’s also an option like the other tools we’ve mentioned to preview your animations. Slate is all about simplifying the way you create sprites and animations. Plus, you can customize your interface. So, you only see what you want without any additional tools on the side-bar in the way. It’s a no-frills type of pixel editor that keeps things simple. Pixilart is a free online pixel art maker and social app that allows you to create not only pixel animations and sprites but icons as well. Your images can be saved or shared with your friends via social networks. It’s geared towards retro 8-bit art lovers of all ages as a safe place to interact and share. You can chat and interact with thousands of active community members into pixel art. It’s the perfect stomping ground for newbies learning how to make pixel art. They also have a mobile app version available for both iOS and Google Play. The Pixie Pixel Editor is another free browser-based tool that you can use. This simplistic bare-bones pixel art maker has all the basic painting and drawing tools necessary to make your own pixel art. Along with the core drawing tools it features quick tips, replay, save, and resize options. It’s nothing fancy, but it’s a handy website to bookmark and use when you’re in a crunch or want to practice your pixel making skills.